1719: born in Edo (according to some documents, his birthyear may be 1723). Younger son of the zamoto Nakamura Kanzaburô VI. 11th lunar month of 1733: first stage appearance, at the Nakamuraza, where he receives the name of Nakamura Katsujûrô I and plays a child role in the drama "Nagi no Ha Asahi Genji". 11th lunar month of 1745: Nakamura Katsujûrô takes the name of Nakamura Denkurô II at the Nakamuraza, playing in the drama "Suehiro Izu Nikki", which celebrates the arrival in Edo of the Kamigata actor Fujikawa Heikurô and the shûmei of Ôtani Hiroemon II. Spring 1746: Denkurô achieves a great success at the Nakamuraza, playing the role of Kobayashi no Asahina in the drama "Fuji no Yuki Mitsugi Soga". This role is closely associated to the great actor Nakamura Denkurô I. 5th lunar month of 1747: the play "Sugawara Denju Tenarai Kagami" is produced at the Nakamuraza for the first time; Denkurô plays the role of Umeômaru [casting]. 1st lunar month of 1748: Denkurô plays at the Nakamuraza the role of Kobayashi no Asahina in the drama "Kazari Ebi Yoroi Soga". 5th lunar month of 1748: the drama "Yoshitsune Senbon Zakura" is performed for the first time in Edo, at the Nakamuraza; Denkurô plays the roles of Tokiaya Ginpei and Taira no Tomomori [casting]. 6th lunar month of 1749: the play "Kanadehon Chûshingura" is produced at the Nakamuraza for the first time; Denkurô plays the role of Teraoka Heiemon [casting]. 8th lunar month of 1750: his father retires, taking the name of Nakamura Kankurô II and giving the management of the Nakamuraza to his elder son Nakamura Akashi III, who becomes Nakamura Kanzaburô VII. 7th lunar month of 1751: first Kabuki adaptation of the puppet theater drama "Koi Nyôbô Somewake Tazuna", which was originally written by Miyoshi Shôraku and Yoshida Kanshi in the 2nd lunar month of 1751. 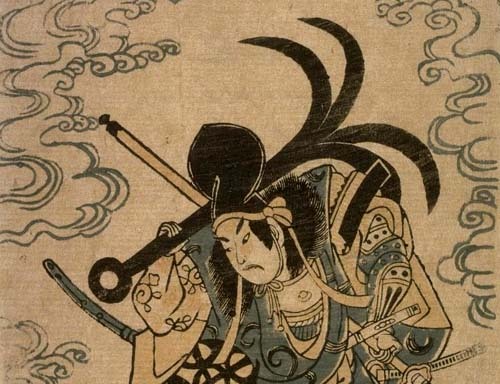 The play is staged in Edo at the Nakamuraza; Denkurô plays the role of Yurugi no Saemon [casting]. 4th lunar month of 1752: first Kabuki adaptation of the puppet theater drama "Ichi-no-Tani Futaba Gunki", which is staged in Edo at the Moritaza; Denkurô plays the roles of the warrior Kumagai Jirô Naozane and the yakko Tagohei [casting]. 11th lunar month of 1754: Denkurô plays at the Nakamuraza the role of Kudô Kanaishimaru in the kaomise drama "Miura no Ôsuke Bumon no Kotobuki", which celebrates the shûmei of Ichikawa Danjûrô IV, Matsumoto Kôshirô III and Tsuuchi Monzaburô II. 1st lunar month of 1755: Denkurô plays in the same theater the roles of Suruga no Jirô and Kobayashi no Asahina in the new year sogamono "Waka Midori Nishiki Soga". 11th lunar month of 1757: his father Nakamura Kankurô II dies. 11th lunar month of 1764: Denkurô achieves a great success at the Moritaza by playing in the drama "Gyosei Kanatami no Megumi". 2nd lunar month of 1773: the Nakamuraza celebrates its 150th anniversary. 2nd lunar month of 1775: his brother Nakamura Kanzaburô VII dies. 9th lunar month of 1775: Nakamura Denkurô II takes the name of Nakamura Kanzaburô VIII and becomes the new zamoto of the Nakamuraza. 11th lunar month of 1777: Kanzaburô suddenly falls ill and dies. Nakamura Kanzaburô VIII spent most of his career acting at the Nakamuraza. He was a good jitsugotoshi and an excellent dancer. He ended his career as zamoto of the Nakamuraza for two seasons (he died at the beginning of the third one). He was well-versed in Tea Ceremony and poetry. He was also the manager of a cosmetics shop in the district of Nihonbashi, selling a successful dye named "Denkurô Some" (Denkurô's dye in Japanese).